MPC is pleased to announce that we continue to meet our sales targets and based on current financial projections are able to distribute some of the company profits back to our growers with an increase in the notional price for conventional NIS to $4.70/kg at 33% Sound Kernel Recovery. The increase of $0.30/kg will apply to all future and already delivered conventional NIS consignments. 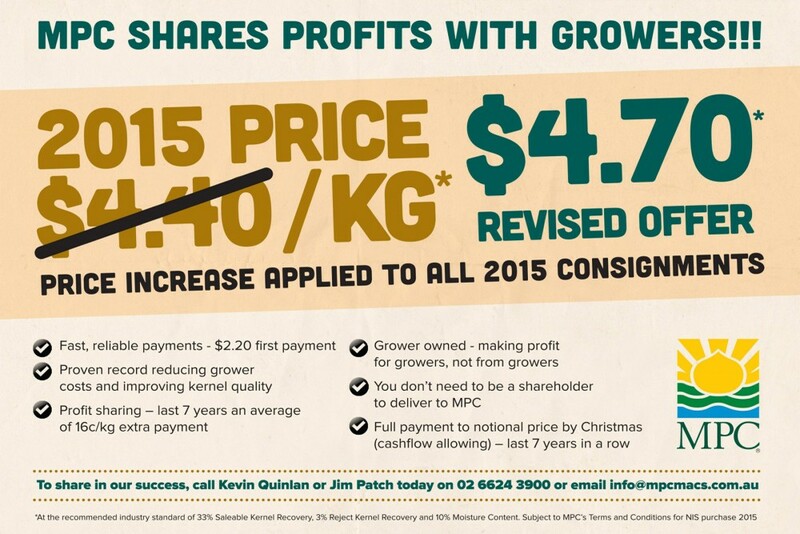 Grower consignment reports will be re-issued reflecting the price change. December 2014 seems a long time ago when there was an offer of $3.90/kg in the market place. Some growers are now living with the decision to lock in at a fixed price and no doubt these processors are rejoicing at the heavily discounted buy price given current market conditions. MPC released our price in February, at $4.40/kg it was high, but conservative based on market conditions and exchange rate, but most importantly it worked within the band of customer price tolerance. The best part is that we expect there is more good news to come. If you haven’t experienced what we have to offer there’s never been a better time.